Dough: In a large bowl combine flour, salt and water. Mix well and knead until the dough becomes homogeneous in texture, about 8-10 minute. In a large bowl combine all filling ingredients except the oil and butter. Mix well . Heat oil and butter in a pan and pour over the filling mixture and adjust for seasoning with salt. Divide the dough into equal-sized balls and roll into very thin circles of roughly 4″ diameter. Dab a tiny bit of water on the edges of the circle. Put a tablespoon-full mix filling in the centre of each circle. Fold the edges over the filling and pinch and twist to seal or fold the Momo in half (into a semi-circular shape) and pinch the edges shut. Get as creative as you like with shapes, as long as you make sure to seal the edges well. Oil the momo steamer rack well. Place the packed Momos. In a steamer dish put water and bring to boil. Put some 2 teaspoons oil in saucepan and bring to heat on light flame. Add tomato, green chili and garlic cloves and cover the saucepan with lid until tomato gets tender than put whole into a mixer and grind it. 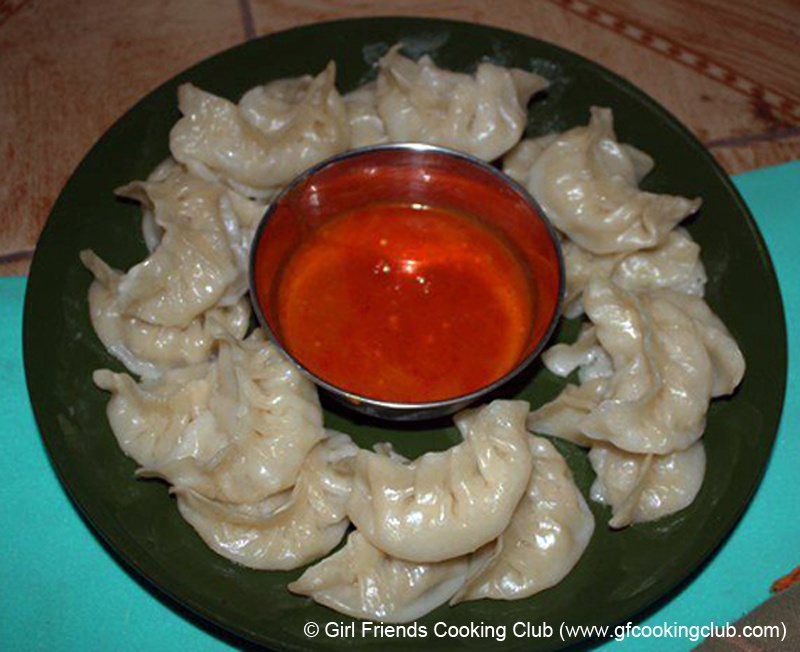 This entry was posted in All Recipes, Nepali Food Recipes, Snacks & Appetizers, Vegetables and tagged Iskus ko Momo, Nepali Cuisine, Nepali Recipes by Kamakshi. Bookmark the permalink. Had no idea you could make momos out of iskus!!! Monisha, Iskus is one of the best vegetable filling for momos. It comes out much better than other alternatives like cabbage etc. I have personally gone and had this dish many time in my friend, Amrita’s place and I can vouch that they are extremely delicious ! I hope u enjoy it as well ! Can I ask what kind of cheese ? Is it paneer or just grated block cheese eg Tasty cheese ? Elle, it is not paneer . You can use grated block cheese …. happy cooking and glad to know that you are enjoying the recipes in the website ! I have shared the link to this recipe in Nepali Khana Khazana Facebook page.